Buying and moving into a first home is a big deal. Odds are, the newbies could use help. From tools to spices, these housewarming gifts will not only prove practical for novice property owners—they'll help them take pride in the place, too. First-time homeowners will definitely appreciate a tool kit. It doesn't need to be expensive or contain top-of-the-line tools, although quality ones can last generations. 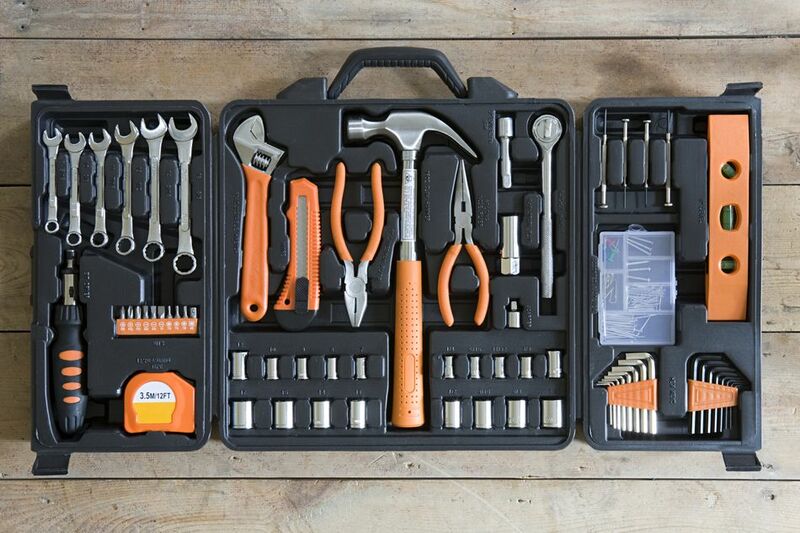 A basic home repair toolbox contains essential items such as a hammer, hacksaw, pliers, assorted screwdrivers, a plumber's wrench, a basin wrench, a drill, and a tape measure. Why not hire a locksmith to rekey all the doors? It's not only a thoughtful gift, it also promotes security. Homeowners receive a set of keys to the home at closing, of course, but who knows how many duplicates are out there—in the hands of contractors, neighbors, or even a kid who found a set lying in the street? You'd just pay for the locksmith's services, allowing the first-time homebuyers to specify what they want done. They might prefer new handles and locksets, especially if the existing hardware is outdated or worn. They might like to have all the doors, including the garage, adjusted to use one key. Plants brighten up every space. Even if your homebuyer wasn't born with a green thumb, anybody can grow indoor house plants if they choose the right ones. Popular, hard-to-kill specimens include a spider plant, peace lily, snake plant, philodendron, or rubber tree. These types of plants are inexpensive, so you might want to also buy a decorative plant holder and tie a bright ribbon around the base. Odds are that someone who is a first-time homeowner is a first-time yard owner, too. Hoes, rakes, hoses, and shovels always come in handy; and if there's talk of gardens, you can expand the tool list to include pruners, spades, and potting benches. Another possibility is decorations like a gazing ball or ornamental figurines. Even townhouse and second-floor condo dwellers utilize small spaces such as balconies or tiny patios for container gardening. They could use a set of small garden tools, such as a trowel, dutch rake, and watering can. Staying on top of home maintenance keeps a home running smoothly. But many first-time homeowners have never replaced a furnace filter, much less know how often a filter should be replaced. A good home maintenance and repair book—preferably lavishly illustrated—will address those types of concerns. It should explain step-by-step how to make simple repairs such as unplugging a clogged garbage disposal, replacing fluorescent light bulbs, or cleaning out a dryer vent. The book should also deal with routine, seasonal maintenance issues such winterizing a home or how often to clean gutters. Your first-time homeowners may enjoy a subscription to a periodical dedicated to their style of home. You can find magazines specializing not only in historic houses in general but in just about any style or period you can think of, from Victorian Queen Annes to Craftsman bungalows. Modernists might enjoy the avant-garde Dwell or Wallpaper*, and of course, Architectural Digest caters to all house-proud types. Lifestyle magazines offering pragmatic interior design advice are another option: think Better Homes and Gardens, House Beautiful, or Martha Stewart Living. It's likely that your first-time homebuyer owns neither a spice rack nor quality spices—because who could do serious cooking in that tiny apartment kitchen? Now, though, those folks can get serious, and a collection of spices can jump-start culinary projects. These types of spices may cost a little more, but the difference in the taste and smell is dramatic. You don't have to fly to Granada to find fresh, high-grade herbs and spices, but it's rare to find them in a supermarket. Along with local gourmet stores, there may be retail outlets or specialists such as Penzeys within driving distance, or you may need to shop online. And yes, the rack is a good idea, because—contrary to popular belief—spices should never be stored above the stove. Whether using a small Hibachi on a balcony or firing up a super-duper gas grill on the back patio, many first-time homebuyers can't wait to host an outdoor barbecue. A sparkly new BBQ or grill sets, complete with tongs, forks, spatulas, and oven mitts, is always welcome for these folks. If you want to splurge (and they have the room), consider a stand-alone coal grill. Tie a bow on top and remember to include a bag of charcoal. Becoming a homeowner often unleashes one's inner domestic animal. So what better way to feed the beast than with a cookbook—or two or three? For those learning the basics (how long do I roast that Thanksgiving turkey? ), consider time-honored beginner's tomes like "The Joy of Cooking," "The New York Times Cookbook," or Mark Bittman's "How to Cook Everything." For more advanced or creative cooks—say, those folks who installed a professional-equipped kitchen with a six-burner Viking stove and Sub-Zero refrigerator—you could offer books specializing in their favorite cuisine, by their favorite chef, or of historical interest, like the bound recipe sets from the legendary Gourmet magazine. If your homeowners are digitally adept, offer to pay for tablet versions of these books or a cooking app.